EISLAB at the Department of Computer Science, Space and Electrical Engineering at Luleå University of Technology is taking part in the design of the EISCAT_3D radar. The system will consist of several large phased-array antenna transmit/receive sites located in northern Norway, Finland and Sweden, each comprising tens of thousands individual antenna elements. When it has been built, EISCAT_3D will be capable of making measurements from the upper stratosphere to the magnetosphere and beyond, contributing to basic, environmental and applied science that underpins the use of space by contemporary society. EISLAB is looking for PostDoc or Research engineer in Antenna and Antenna Array Design. The aim of the work is to evaluate and design antenna elements and antenna arrays suitable for the harsh conditions in northern Scandinavia. The antenna elements, the array layout, and the associated calibration systems will all need to be studied. The results will be used to design the antenna arrays for the EISCAT_3D radar. In order to achieve a robust and mass producible design, the work will need to be carried out in collaboration with suitable manufacturers. The project is collaboration between several parties, which means that travel and interaction will be a part of the work. The position is a project employment; the position is time limited to two years. We welcome applications from engineers with extensive experience in antenna design, as well as applications from researchers in the field. 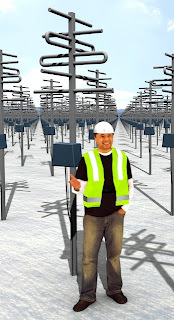 Prior knowledge and experience in electromagnetic simulations, antenna design, and antenna measurements is required. Previous experience from work on antenna arrays and signal processing is valuable. The applicant must be able to communicate well in English. For further information, please contact Associate Professor Jonny Johansson +46 (0)920-49 17 03, jonny.johansson at ltu.se. For information on how to apply, please refer to Vacancies at Luleå University. The University of Tromsø has a PhD position in Physics (Space Physics) vacant for applicants who would like to complete a PhD degree. The faculty offers a PhD programme in Physics. The position is attached to EISCAT, Department of Physics and Technology, which has the programme option Space Physics. The position is organised under the Department of Physics and Technology, which consists of three research groups: energy and climate physics, space physics, and electrical engineering. The department provides education on the Bachelor, Master, and PhD levels. The department comprises 18 permanent professors, and a technical/administrative staff of 10 persons. The department conducts research and education at a high international level, and our employees are engaged in several international collaborative projects. The desired research area for the vacant position is within theoretical and experimental investigations of the Earth’s upper and/or middle polar atmosphere/ionosphere. The experiments are conducted mainly by radars (EISCAT and other radar facilities) and/or rockets. Application deadline: 8th March 2012. For details visit: http://www.jobbnorge.no/job.aspx?jobid=80866 and/or contact Professor Cesar La Hoz, tel. +47 77 64 51 61, e-mail: cesar.la.hoz at phys.uit.no or Professor Unni Pia Løvhaug, tel. +47 77 64 62 92, e-mail: unni.pia.lovhaug at uit.no. Andy Breen was born in Sunderland in 1964. Many of us first met him as a young PhD student at Aberystwyth University in the late 1980’s. The enthusiasm and philosophy of his supervisor, Phil Williams, resonated deeply with him and they quickly formed a highly effective team. For a few years, they carried out the kind of research that had been expected from the European Incoherent Scatter (EISCAT) radars in northern Scandinavia, studying the detailed physics and chemistry of the upper atmosphere when bombarded with kilovolt electrons in the auroral oval. 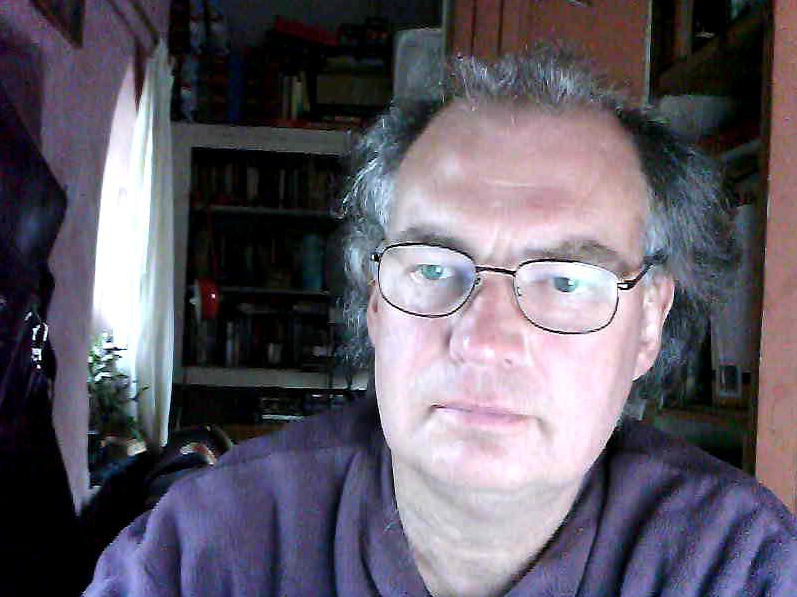 After working at Southampton University and the Max-Planck Institut für Aeronomie at Lindau, he returned to Aberystwyth in 1998 as a PPARC (Particle Physics and Astronomy Research Council) Advanced Research Fellow, moving onto the Academic staff there in 2001. Reunited with Phil Williams, they began to forge a novel and unique research programme that had never been envisaged for EISCAT. Specifically, they exploited the long baselines of the receiver sites to monitor the scintillation of radio stars caused by irregularities in interplanetary space and devised a correlation technique to study the early acceleration of the supersonic solar wind outflow. They realised that the EISCAT frequencies allowed them to make measurements closer to the Sun than anybody else had managed. This was real cutting-edge, exciting, world-leading science. Phil may have supplied the initial idea (and his usual enthusiasm), but it was Andy who worked through the details, made the method actually work and compared the results to data from solar coronagraphs and in-situ observations from various spacecraft in interplanetary space. By the time Phil moved on to become a Member of Parliament in Cardiff, Andy was a world leader in his field - working with, and respected by, solar physicists from all around the world. He became a co-investigator on the Heliospheric Imager instrument on the NASA STEREO mission and on the Solar and Heliospheric Key Science Project for the LOFAR radio telescope network. During 2007 and 2008 he was one of the leading organisers for the International Heliophysical Year. But these successes did not come easily – far from it. Early in his career, he fell victim to Myasthenia Gravis, with his immune system increasingly attacking his own nervous system. This condition affects just 1 in approximately 20,000 people in the UK and is very rare indeed in young men. The need to suppress his immunity led to throat cancer, from which he also recovered, but thereafter he spoke in a husky, breathless voice. A lesser individual would have crumbled emotionally and physically - but you couldn't get Andy Breen down that easily. The disease, and other consequent medical complications such as pneumonia, very nearly killed him a number of times and it is hard to convey the scale of the struggle he faced. Often he would support his chin or forehead in a specially-made frame so he could keep working even though he was too weak to hold his own head up. That he achieved as much as he did is testament to his extraordinary willpower and bravery as well as his talent. He survived to become the most amiable of eccentrics. He had eclectic tastes and championed the unknown and obscure in music, literature and the arts, as well as in science - because he understood that good things have small, often unpromising, origins. It was the same in his attitudes towards people and politics - he supported the young, the struggling and the oppressed, whilst never needing to despise the powerful, the rich or the successful - unless, that is, they misused their position, their wealth or their influence: then they would incur his wrath, which could be formidable and very witty. He was exceptionally kind to those who deserved or needed it and very funny, both qualities inspiring loyalty and affection in his students and colleagues. He got real joy and relaxation from sailing when he was able, and it was a huge pleasure to follow his travels along the Scottish coastline on the internet. But the thing he loved more than anything else was being in the company of his friends, laughing with them and holding forth on one of his passions – not because he thought he was interesting (which he always was) but because he thought the subject was interesting (which it almost always was). His wit, spirit, humanity, courage and decency touched many more people than he realised and his early death from complications following heart surgery, at the age of just 47, means he will be hugely missed by his friends, his colleagues at Aberystwyth and all in the EISCAT and LOFAR communities that were lucky enough to count him as one of their own. 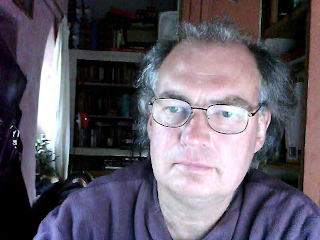 Text: Mike Lockwood, Reading, U.K.
Photo: Andy Breen (last profile photo on his actively used Facebook page). Applications are invited for a post-doctoral position to study space plasma physics, in particular in areas of magnetic reconnection, shocks, particle acceleration and ULF and VLF wave environment of the radiation belts. Scientific studies would be primarily based on the data from the multi- spacecraft missions Cluster and THEMIS. The Space Plasma Physics Research Programme at the Swedish Institute of Space Physics (IRF) has PI responsibility for the Electric Field and Wave (EFW) instrument on Cluster. We work with data from all instruments on Cluster as well as with data from other space missions. Analysis of data is an essential part of the work and experience in combining advanced data analysis with theoretical modelling is an advantage, as are strong computer programming skills. Interest and experience in development of instrumental techniques and methods will likewise be positively valued, as will experience in coordination of scientific activities. Further information on space physics research in Uppsala can be found at http://www.irfu.se. For further information please contact Dr Yuri Khotyaintsev (yuri at irfu.se) and Dr Andris Vaivads (andris at irfu.se). Trade union representative is Elisabeth Dackborn (elisabeth.dackborn at irfu.se). Candidates should have completed a PhD during 2009 or later. Candidates planning to obtain their PhD degree no later than June 2012 can also apply. If the candidate has an older degree and wants to refer to special circumstances, such as parental leave, this should be clearly stated. The candidate should not currently be an active researcher at the Swedish Institute of Space Physics in Uppsala or the Department of Physics and Astronomy at Uppsala University, Sweden. The position is available at the Uppsala office of the Swedish Institute of Space Physics, located at the Ångström Laboratory in Uppsala, Sweden, from the second half of 2012 for one year with a possibility of extension. Closing date is March 5, 2012. Applications should include a CV, a short letter stating the applicant's research interests and relevant experience, copies of undergraduate and PhD degree certificates (or a letter from the supervisor stating the date when the PhD degree will be obtained), description and proof of previous post-doctoral positions and/or similar relevant research work (if available), names and contact information for two professional references, and reprints of not more than 4 selected publications. Applications shall be sent to: Registrator, Swedish Institute of Space Physics, Box 812, SE-981 28 Kiruna, Sweden, or by email to: registrator at irf.se (Tel. +46 980 79061). Reference: Dnr 32-16/12. 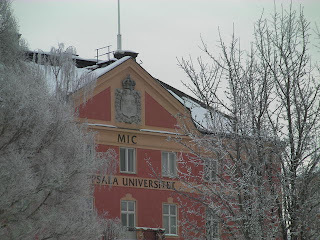 Photo from Uppsala Campus by Stephan Buchert, IRF, Uppsala. This week we were lucky and saw a really nice display of the Northern Lights across large parts of Northern Scandinavia and Finland. 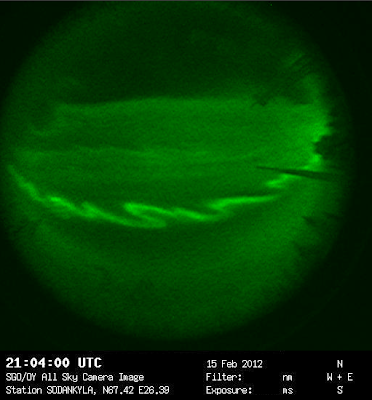 The image above was taken by the All-Sky Camera of the Sodankylä Geophysical Observatory. 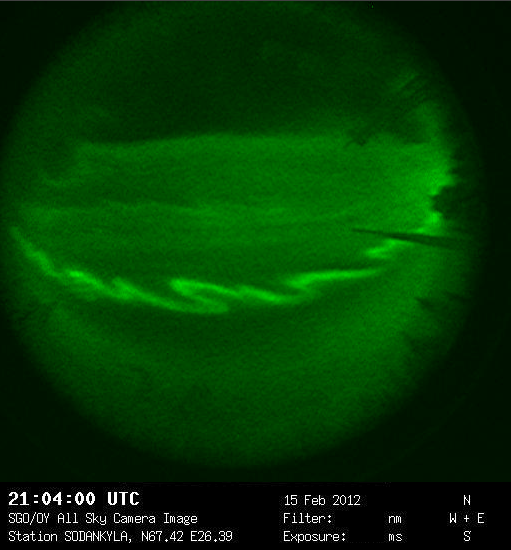 A black & white image of the auroral green line at 5577Å is available in real-time on SGO's web pages. For a movie version, please go here. With this photo we wish all of you a very nice weekend! Now you can be in the driver's seat yourself. The current Director of EISCAT, Dr Esa Turunen, will return to Sodankylä Geophysical Observatory at the end of 2012, and thus the EISCAT Scientific Association will appoint a new Director from January 2013. The successful candidate will have a strong scientific background with broad experience in geospace and atmospheric physics or related fields, as well as good technical insight and excellent organisational skills. He/she needs to demonstrate the leadership qualities required to promote and lead the EISCAT Scientific Association during a period of change, as the organisation moves toward a new generation of facilities. A critical part of the new Director’s role will be to make the high-level contacts needed to attract new funding and bring more international partners into EISCAT. Experience of working with similar international research infrastructures and managing large international projects would therefore be a great advantage. The full-time post is for a three-year period with the possibility of renewal for a further three years. The Director is based at the EISCAT Headquarters in Kiruna, Sweden. However a considerable amount of international travel should be expected. Applications should include a resume and a one page statement of the applicant’s vision for EISCAT and should be sent by email to: Director2013 at eiscat.se, latest 17:00 (CET) on Wednesday 15 February 2012. Applications will be treated confidentially. Employment terms and conditions will be subject to negotiation with the board of EISCAT, the Council. For more information about the position, please contact the current Director, Dr Esa Turunen (Esa.Turunen at eiscat.se) or the Chairperson of Council, Dr Tomas Andersson (tomas.andersson at vr.se). New Deadline 17th February 2012! In 2012, the development of a number of new radar facilities will have advanced significantly: for instance, PANSY will be in operation, hopefully the US Antarctic AMISR will be under construction, and the FP7 EISCAT_3D Preparatory Phase Project will have reached half-time. This session aims to find synergies between different groups using existing and future radars to study the middle and upper atmosphere and ionosphere. Discussions are envisaged of recent scientific results and radar applications as well as development of measurement methods and their implementation. This session is especially targeted to science communities working with incoherent scatter radars, meteor radars, coherent ionospheric radars (SuperDARN etc), MST radars, ionosondes etc. We welcome to submit your abstract to this session! Deadline 10th February 2012!